I know, I know…It’s only September. I used to work at a Michael’s craft store and I was always amazed when the boxes (and boxes and boxes) of Christmas decorations would arrive the first week of October…three weeks before Halloween. It just felt wrong. But I have a very good reason for bringing up Christmas in September. For several years my husband Jason has been dreaming and planning on recording a Christmas album. If you’ve been a blog reader for a while you probably remember when he released a lullabies album in February 2012 called Acoustic Lullabies. He’s had the idea for a Christmas album well before that but put it on hold to create a CD of beautiful guitar music dedicated to our daughter Ali, and the sales of that album helped fund her private adoption. Well, he’s finally finished with the long-awaited Christmas album. I’m so excited about it! It’s really wonderful. I’ve seriously had to resist the urge to set up the Christmas tree because overhearing some of the recording process and then listening to the almost-finished product has really brought on the Christmas spirit at our house. In September. Jason’s not just any average guitar player—he’s been obsessed with the six-stringed instrument for 20 years. He is trained and seasoned in classical, jazz, rock, country, finger-style guitar and you’ll hear all those influences on this album. I’m a big fan. So anyway… producing an album is an investment. There is an initial expense and then money is gradually recouped through sales. His lullabies album was successful and worth the risk but we despise debt. We decided to try something different this time. Jason set up a Kickstarter campaign to fund the initial expense for mixing and duplication (recording is already complete) through pledges for pre-orders of the album. 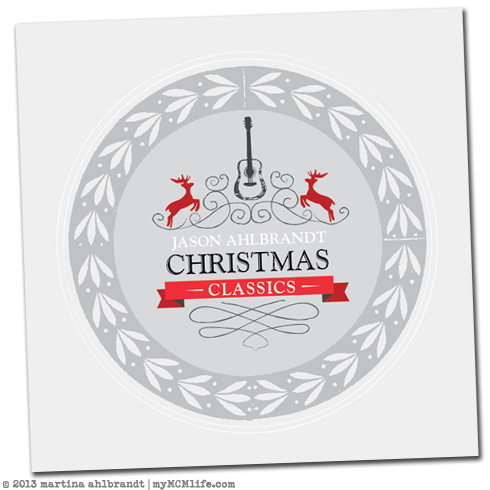 At the base level a $15 pledge results in Christmas Classics shipped to you when it releases in October. Higher pledges have various rewards like autographed or gift wrapped CDs and bulk discounts. If he doesn’t reach his goal (which covers the cost of mixing and a minimum initial order of 1000 CDs), he doesn’t get any money and the pledges are all voided. It’s an all or none situation. Would you consider pledging money to pre-order this CD? I guarantee you’ll love it. You’ll love it so much that you’ll want to give copies to your kids’ teachers and soccer coaches, your best friend, your hard-to-buy-for-music-loving brother, your chiropractor, your insurance agent, etc. On Jason’s Kickstarter page, you can also watch the silly video we made to promote the project, and hear one of the songs. It was late at night and we may have thought it was a little funnier than it actually is…but all is redeemed by Ali’s incredible sweetness at the end. This entry was posted on Tuesday, September 10th, 2013 at 6:00 am and is filed under Art, Art: music, Family, Family: Jason. You can follow any responses to this entry through the RSS 2.0 feed. You can skip to the end and leave a response. Pinging is currently not allowed. 5 Responses to Merry Christmas! A Christmas album, yay! I’d love to back this project but I see the album will only ship to the US…I’m in Canada. Is there any way to get around this? Love this! With temps pushing 100 degrees in my neck of the woods, thinking about a cozy Christmas is exactly what I needed. I will definitely make my way over to Jason’s Kickistarter page. I also did some promoting on my blog. I hope he reaches his goal! Thanks to the promotion from Mrs. Something, I found out about your Christmas album. Looking forward to its production!! Heard about this from Mrs. Something. I will spread this around to my colleagues. I hope he reaches his goal.